After a successful ninth season, the MINI Challenge returned to RaceDepartment for a tenth season. On a six round online championship on Friday nights, thirty of the most committed pilots made for a full one division series. 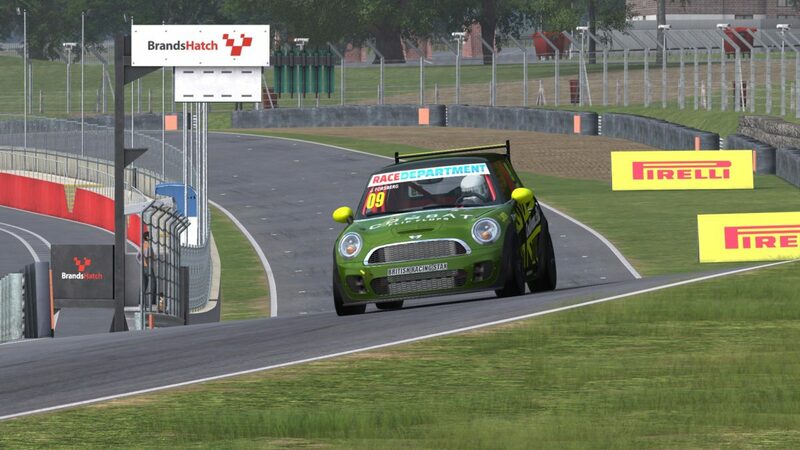 Season 10 mimicked the MINI Challenge UK, visiting such historic race tracks as Oulton Park and Brands Hatch. The RDMC S10 was the first season that STAX Racing entered at RaceDepartment. STAX Racing entered two MINI John Cooper works in the RaceDepartment MINI Challenge Season 10 (RMDC S10). The drivers were Andrew Waring, who already participated in one round of the 2016 World GT Series for us, and Jazz Forsberg, a newcomer to the team. While Andrew targeted the top spots, Jazz said that he mainly wanted to improve his racecraft. After an early crash, Andrew stormed through the field in Race One. However, after setting the fastest lap of the race, he had a second crash and had to retire from the race. Jazz had a quieter race compared to his teammate, finishing in P13. All in all, there were a lot of positives for the team in this race. Andrew proved that he had the pace to battle for race wins, while Jazz showed good consistency during the race and finished in the points. However, both drivers said after the race that they are not satisfied with the race result. Andrew’s DNF was a huge setback in his championship campaign, while Jazz was unhappy that he made some smaller mistakes. Unfortunately, both STAX Racing drivers were unable to participate in the second round in Snetterton. While Jazz knew that for some time and was able to report his absence in advance, Andrew was stuck at work and missed the race. As per the rules, he was excluded from starting in the remaining races. As a result, STAX Racing continued as a one-car team for the rest of the season. This had an immediate effect for Round Three: Jazz, having to work on the setup work alone now, struggled to find any pace in Brands Hatch. Jazz qualified in P20. In the first part of the race, the field was bunched up together and places were swapped at every corner. However, this meant that Jazz had to spend quite some time looking in his mirrors and he began to make smaller mistakes. However these setbacks didn’t discourage the Frenchman and it is a testament to his determination that he was able to gain back several positions after each incident. Being in 17th position at roughly the half of the race meant that he still had a chance to score some points. After his first and only pitstop, the Top 4 were approaching Jazz fast to lap him before the first corner, Paddock Hill Bend. Unfortunately, this compromised the line of the STAX Racing driver going into the fast right-hander and his car began to slide. Jazz crashed into the barrier, but lost no position. After this incident, Jazz concentrated on bringing the car home in one piece. In the end, he finished in 19th position. The next race of the season was held in Silverstone. A change of pedals meant that Jazz would be compromised for this race while benefitting from it in the long run. Jazz qualified in P18 and was able to gain a spot right after the start. Exiting Village corner, he had to avoid a spinning car and gained even more places, finding himself in P14. After the start and the initial chaos, the field settled down a bit. Nonetheless, there were some great battles for positions up and down the grid. Jazz was in a group of roughly nine cars, each bumper to bumper for several laps, and great racing ensued. Unfortunately, on Lap 15, he encountered a 3 or 4 second long computer freeze just as he was coming out of Farm Curve. As a result, his car was sent spiraling towards the barrier and crashed hard into it. Jazz wrestled the car around the track, but missed the pit entry due to the car being nearly undrivable and decided to retire from the race shortly after that. Following two rather disappointing races, STAX Racing driver Jazz Forsberg was highly motivated to finish in the points on the second visit in Brands Hatch. Things were looking good when he qualified in 12th position. Rather atypically for a touring car race, Jazz’ first few laps were rather quiet. By lap 7, he had gained a few seconds on the cars behind him while there was a gap of a few seconds to the cars in front. As Jazz went into the 15th lap, John Souter slowly but surely closed the gap to Jazz and, in lap 17, a battle started that should wage for most of the race. In the following laps, the two MINI drivers showed some good fights for position which got even more exciting when Steve Le Gallez joined the battle for positions. In the closing stages of the race, him and Zamora found themselves in a battle for 12th place: Zamora was able to pass Jazz on Lap 42, but the Frenchman was able to follow his opponent closely and passed him one lap later. On the last lap, Zamora passed Jazz again in Druids Bend. In the end, Forsberg finished in P13, matching his best finish this season and ending a three race run of non-points scoring finishes. The final race of the season was again held in Oulton Park, this time using the Fosters Circuit layout. Jazz qualified in 13th position, but a suboptimal start meant that he entered the first turn in 15th place. In the second lap he was able to pass Rob Milliken, one of many battles between those two drivers in this race. On lap five, both drivers went onto the grass after an optimistic overtaking maneuver by Jazz. The Frenchman initially lost two places and then, as a gentleman gesture, allowed Rob to repass him. On lap 25, Jazz tried to overtake Rob on the outside of Turn 2, but touched the grass and was unable to slow down the car for Turn 3. He crashed into the barrier, but luckily escaped with minor bodywork damage. On lap 38, Jazz, who was in P12 at this point, made his first and only pit stop and rejoined the race in 15th position. After this, the race calmed down for Jazz. He was able to gain another place shortly after that and, on lap 64, decided to finish the race and indeed the season with some major sideways action going into Druid’s corner. However this mean that Mark Beslin was able to overtake Jazz, which is why he finished the last race of the season in P15, netting one more point in the process. In the end, Jazz Forsberg finished the season in 19th position with 7 points. He admits that in the middle of the season, he wasn’t up to speed for a couple of races. But STAX Racing isn’t all about the results, and Jazz made clear that the season was very helpful for his simracing career and that he wants to start for STAX Racing again in the future. Considering that he had a teammate for just one race and had to prepare for the rest of the races by himself, we think that as a self-professed newcomer to simracing he did a great job! Andrew Waring finished the season in 21st position with one point, due to his fastest lap in the first race. STAX Racing was 16th in the Teams Championship. We want to congratulate Ross McGregor for his dominant win of the championship and say thanks to all of our competitors for all the close and fair racing all season long.